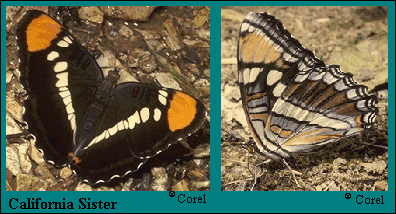 Identification: Upperside is brownish black with an orange patch at the forewing apex. White median band across both wings is broken on the forewing. Life history: Males perch and patrol all day for receptive females. Eggs are laid singly on leaf edges; caterpillars feed on mature leaves. Young caterpillars make a long perch by extending a leaf vein with dung and silk. Partially-grown caterpillars hibernate. Flight: Two flights from May-September. Caterpillar hosts: Leaves of oaks (Quercus) particularly evergreens. Adult food: Rotting fruit, aphid honeydew, sometimes flower nectar such as California buckeye. Habitat: Oak-covered hills, groves, and stream valleys. Range: Southern Oregon east to Colorado, south to southern California, Arizona, South Texas, and Mexico.